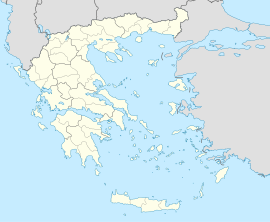 Drama (Greek: Δράμα [ˈðrama]) is a city and municipality in northeastern Greece in Macedonia. Drama is the capital of the regional unit of Drama which is part of the East Macedonia and Thrace region. The town (pop. 44,823 in 2011) is the economic center of the municipality (pop. 58,944), which in turn comprises 60 percent of the regional unit's population. The next largest communities in the municipality are Choristi (pop. 2,725), Χiropótamos (2,554), Kallífytos (1,282), Kalós Agrós (1,178), and Koudoúnia (996). Part of the town's Byzantine walls. Drama hosts the "Eleftheria", cultural events in commemoration of the city's liberation, at the end of June or beginning of July, and an annual film festival in September. Archaeological finds show that in the area of the modern city there used to be an ancient Greek settlement named Dyrama (Greek: Δύραμα) or alternatively Hydrama (Greek: Ύδραμα), both meaning "rich in water". Some scholars associate Drama with the ancient Greek Drabescus (Greek: Δράβησκος). Hydrama was notable as the place of worship for many Gods of classical Greek mythology, especially Apollo and Artemis. With the passage of time Dyrama became Drama. In the South Slavic languages, the city is known as Драма which is itself a transliteration of the Greek name. The municipality has an area of 840.103 km2, the municipal unit 488.830 km2. Drama was occupied by Bulgarian troops in the wake of the German invasion of Greece, from 1941 to 1944 during World War II. On 29 September 1941, in response to local communist guerrilla attacks against the Bulgarians in the villages of Drama, the Bulgarian occupation forces applied harsh reprisals in Drama, Doxato and several villages like Choristi, Kyrgia, Koudounia and Prosotsani. On 4 March 1943, after midnight, the Bulgarian military authorities rounded up the Jewish population across their zone of occupation in eastern Macedonia and Thrace. The 4,000-strong community, including 589 Jews from Drama, was carried by train into Bulgarian territory and assembled in the tobacco warehouses, which were empty at that time of year. From there, they were taken by train to the Treblinka extermination camp. None of the 589 Jews from Drama ever returned. In the recent past the economy of the Drama area relied heavily on the local paper and textile-clothing industries. However, these industries have either closed down or moved across the border to Bulgaria, because of the low demands of the Bulgarian workforce, with a negative impact on the local economy and employment. The situation worsened after 2007, when Bulgaria was admitted to the EU, and local Greek businessmen moved to expand their operations there. Other sources of revenue include agriculture, consisting mainly of tobacco plantations, small-scale mining (particularly of marble) and forestry. Recently, there have been efforts to exploit the rich local natural environment and to develop ecotourism. There is a modern ski resort on Mount Falakro. Drama also hosts an annual short film festival. The springs of Agia Varvara. Since 1978, Drama hosts Drama International Short Film Festival. In 1987, the festival was recognized nationally. In 1995, it added the International competition section where short films from all over the world visiting the city every year. In 1996, the festival was included in the National Cultural Network of Cities by the Greek Ministry of Culture. The Archaeological Museum of Drama covers human presence in the regional unit of Drama from the mid Paleolithic Period (50,000 years before present) with traces of life from Paleolithic hunts in the caves of the source of the Angitis, up to modern times (1913). The exhibition space consists of three main halls. In the first archaeological finds from the cave of Maara give witness to the presence of nomadic hunters in the area from the mid Palaeolithic period, while other finds show us about the life of settled farmers and animal rearers from Neolithic villages and the passage of the Copper Age in the city of Drama and the village of Sitagri. The reproduction of a Neolithic house with finds which describe the activities of Neolithic man and his daily activities is the main centre of interest for visitors of all ages. Bust of Dionysius, found in the area of Kali Vrysi. The same hall continues the journey through time to the Iron Age and later years where the main element was the worship of Dionysius at the city of Drama itself and at Kali Vrysi and other areas of the regional unit. In the second hall architectural sculptures, pottery and coins confirm that life continued in the city and throughout the whole regional unit during early Christian, Byzantine and post-Byzantine years. The visitor is taken through modem recent history by a photographic exhibition relating to the city of Drama, the towns of the regional unit and the mountain villages. The exhibition covers the period from the beginning of Ottoman period up to the middle of the 19th century. In the third hall which is roofed with an atrium, the visitor can admire sculptures arranged into three thematic groups. The first includes architectural sculptures dating from ancient times up to Turkish occupation. The second contains votive monuments connected with the worship of various gods in the Greco-Roman pantheon as well as local deities, with particular reference to Dionysius while the third group of sculptures focuses on funerary monuments from Hellenistic and Roman times. The history of the Christian Church in Drama began during the Byzantine period and underwent difficult and troubled times. From the 14th century when the city was captured by the Ottomans until the 20th century with successive foreign occupations, the Greek Orthodox Church in Drama struggled without end, fed by the blood of many faithful, martyrs to the faith and to the Hellenic ideal and provided succor to its followers through difficult periods. The collection of icons dating from Byzantine times to the 20th century forms the basic core of the museum's exhibits. The Museum of the Cathedral of Drama, founded during the reign of the honourable Bishop Dionysius 1st, is now housed in a recently restored five-storey wing of the Bishop of Drama's palace on Venizelou St. In the spacious and well-attended halls, ecclesiastical treasures of priceless spiritual and artistic value are on exhibition. The Icons of the Virgin Ηοdegetria and the Blessing Lord from the 13th century, icons from the 17th century and particularly from the 19th century decorate and sanctify the place. Moreover, the episcopal canonicals, holy vessels and their covers, many from the 19th century, relics of Chrysostomos of Drama and Smyrni, constitute the most important exhibits in the museum. Many of the exhibits are relics brought by refugees from Asia Minor and Pontus in 1922 from the churches of their ancient homes to their new home, valuable reminders of who they were and where they came from. Organized groups of pilgrims and visitors to the city are advised to contact the office of the Diocese of Drama before visiting the museum to make arrangements. Drama hosts many sport teams in various sports. The most famous and most popular is Doxa Dramas, founded in 1918. Other successful clubs with presence in Greek national divisions are KAOD (basketball club), Pandramaikos FC, Drama 1986 and Amazones Dramas. ^ James I. Porter (2002). Constructions of the Classical Body. University of Michigan Press. pp. 142–. ISBN 978-0-472-08779-2. Retrieved 3 March 2013. ^ Drama (drm) Monthly Climate Average, Drama. World Weather Online. Retrieved 1 September 2016. ^ "יהודי בולגריה - כפשע בינם לבין המוות (Bulgaria's Jews - avoiding the death)" (PDF) (in Hebrew). Yad Vashem Memorial. Retrieved 8 August 2011. ^ "Job Creation and Enterprise Development Department (EMP/ENTERPRISE)" (PDF). Ilo.org. Archived from the original (PDF) on 2009-03-27. Retrieved 2013-03-26. ^ "Short Film Festival in Drama - History". Archived from the original on 6 August 2011. Retrieved 8 August 2011. Wikimedia Commons has media related to Drama city.